It is known simply as 'The Flat Track,' but when the green flag drops at New Hampshire Motor Speedway next spring, 'America's Original Extreme Sport' - American Flat Track - will make its first appearance in New Hampshire, giving race fans a new reason to enjoy the thrill of racing in Loudon. Construction crews are already hard at work on a brand-new racing surface, and in just a few weeks, the dirt and clay will be transformed into an exciting racing venue. "Each year the facility hosts the oldest motorcycle race in America, the Loudon Classic, which is nearing its 100-year anniversary. New Hampshire Motor Speedway is adding an electrifying new chapter of two-wheeled racing to our summertime line-up," said David McGrath, executive vice president and general manager of New Hampshire Motor Speedway. "It's astonishing how much action can be packed onto a quarter-mile flat track when these pro riders enter the arena. We can’t wait to host American Flat Track, and I’m confident this will quickly become a fan favorite." 'The Flat Track’s’ headline event - aptly dubbed the Laconia Short Track - will feature AFT on Saturday, June 15, 2019 during Laconia Motorcycle Week. AFT Twins and AFT Singles classes will compete in a full race program including heat races, semis and a main event, which will co-headline the racing action at New Hampshire Motor Speedway along with the 96th running of the Loudon Classic, the longest running motorcycle race in America, on Sunday, June 16, 2019. 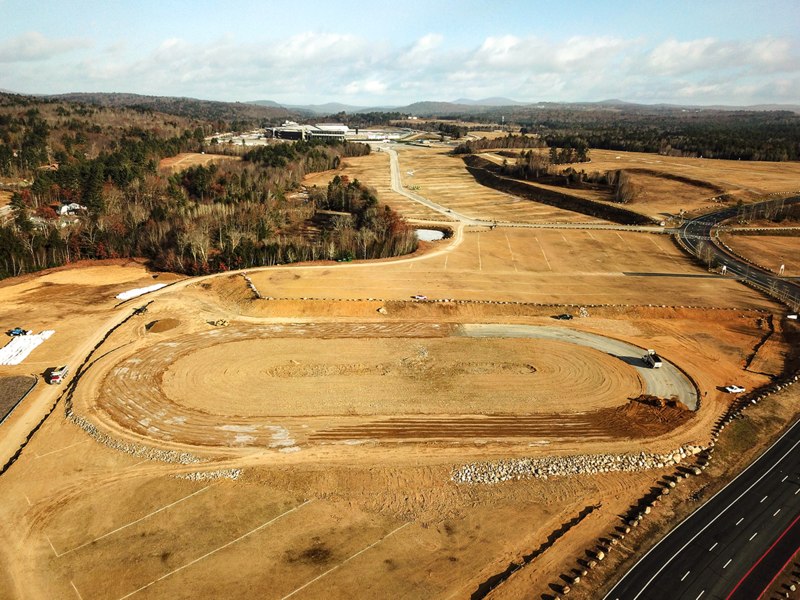 "We look forward to kicking up some dirt at New Hampshire Motor Speedway in 2019," said Cameron Gray, COO of American Flat Track Events. "We are bringing the American Flat Track experience to where our fans are, and New Hampshire is home to many devoted AFT fans. Working together to design and develop this racetrack means we can guarantee some truly exciting, wheel-to-wheel action that will excite fans and riders alike." Located directly behind the North East Motor Sports Museum, crews are turning roughly 186,095 square feet of ground and 3,000 tons of clay to build the 0.25-mile track. Construction on 'The Flat Track’ began in early October and is expected to take three months to complete, depending on winter weather conditions.